Through the eyes of P.J., a 19-year-old man in Manila who recently learned he was HIV-positive, the Mary Johnston Hospital HIV/AIDS program saved his life. “At first, I was so afraid, but with the advice and support of my friend, I decided to get tested for HIV in 2017. I tested positive,” P.J. said in a follow-up interview with the counseling staff at the hospital. “I really didn’t know what to do or what would happen to me. I didn’t know how to tell my mother and my younger brother, but with the help of the counselors, I have become more optimistic. They taught me that I still have a chance to survive and to trust that my family would understand my condition.” P.J. received the test and the follow-up counseling from Mary Johnston staff. The rapid spread of HIV is a growing concern in the Philippines. In November 2016, the National Youth Commission noted the rising number of young Filipinos testing HIV-positive. The head of the commission said, “The HIV epidemic in our country has a new face, and it is the face of a young person.” In addition, only 5 percent of HIV-positive pregnant women have received antiretroviral medicines to prevent mother-to-child transmission of the virus. In 2017, Mary Johnston Hospital applied for a grant from the United Methodist Global AIDS Fund, administered by Global Ministries’ Global Health office. The goal was to pilot an HIV/AIDS program that would educate people in the community about the disease, provide access to HIV testing, and better equip the hospital for counseling and referral services for People Living with HIV (PLHIV). 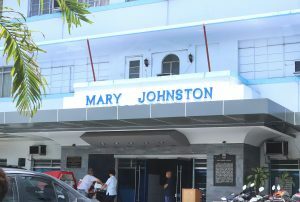 Entrance of the Mary Johnston hospital, Manila, Philippines, a United Methodist support facility in Manila, Philippines.The United Methodist Pan-Asian Abundant Health Forum was held in Manila, Philippines on July 3-4, 2018. It was sponsored by the Global Health unit of GBGM. Participants were from 10 Asian countries and the United States. Photo by Jan Snider, UMCom. The HIV/AIDS program developed by the hospital seeks to complete its objectives by offering workshops and opportunities at the hospital, through community groups and partnerships, and through churches. Major areas of concentration are general HIV 101 education to inform the public about the virus; prevention, access and encouragement for testing; follow-up counseling; and the testing of pregnant mothers coming to the hospital for checkups and deliveries to anticipate and prevent mother-to-child transmission of the virus. An additional objective for Mary Johnston Hospital was the construction of a counseling and conference room for HIV patients. It has been built and equipped with provision for HIV testing and counseling. Part of the grant allowed the hospital to become certified as an HIV/AIDS treatment hub. Mary Johnston Hospital has a long history with the Methodist Church. It was founded in 1906 as a small clinic, the “Dispensaria Betaña,” in a Bible school for women. 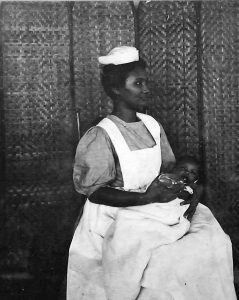 The school principal offered the room for the clinic at the request of Dr. Rebecca Parish, a missionary doctor from Indiana sent by the Women’s Foreign Missionary Society of the Methodist Episcopal Church of the U.S. The hospital was moved to its present site in Tondo, Manila, in 1908. The cost of the lot and the first building was paid from a gift of $12,500 given by Daniel S.B. Johnston, a Methodist layman from St. Paul, Minnesota, as a memorial to his late wife, Mary Johnston, who had served as a missionary. After World War II, the hospital was completely rebuilt, having lost almost everything to firebombing during the war. Today the general hospital serves men, women and children, but it continues the mission of Parish and its partnership with the global Methodist Church. It accepts all patients, regardless of their ability to pay. Providing general education and HIV testing at churches – mainly at St. Paul United Methodist Church in Manila but with an additional workshop at Mount Pisgah UMC in Cavite – has helped to lessen the stigma of HIV/AIDS in the community. Church members and neighbors learn to love and care for people living with HIV rather than fear them. A core team of 24 in the community, 18 in the church and 27 in the hospital received additional training to disseminate information in their communities. Mary Johnston Hospital also trained 30 staff members to become new counselors for HIV-AIDS. After the education activity in the churches, in community settings and at the hospital, about 70 to 90 percent of the participants voluntarily submitted for counseling and testing. One hundred percent signed a pledge of commitment for the “Getting to Zero” battle cry against HIV and AIDS. But for P.J., knowing his own HIV status, participating in an HIV 101 workshop at St. Paul UMC meant something deeper and more personal. Contributions tothe United Methodist Global AIDS fundcan be made through the Advance, #982345. HIV Programming is part of the work of the United Methodist Abundant Health Initiative, General Board of Global Ministries. Christie R. House is a senior writer and editor for the General Board of Global Ministries.